Northern Minnesota native Sandy Lambert started quilting as a young girl, learning from her mother and grandmother. But she stopped as a youngster and didn’t pick it up seriously again until 1984 when a photo of a folk quilt in a magazine caught her eye and made her want to try her hand at it again. 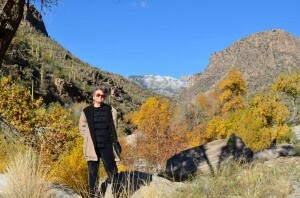 Lambert moved to Phoenix in 1970 and worked in several different hospitals during her 20 years there before relocating to Tucson. 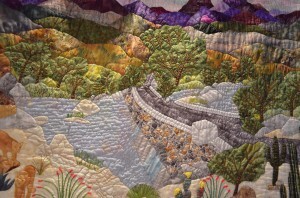 The Tucson move brought with it a whole new community of quilters. 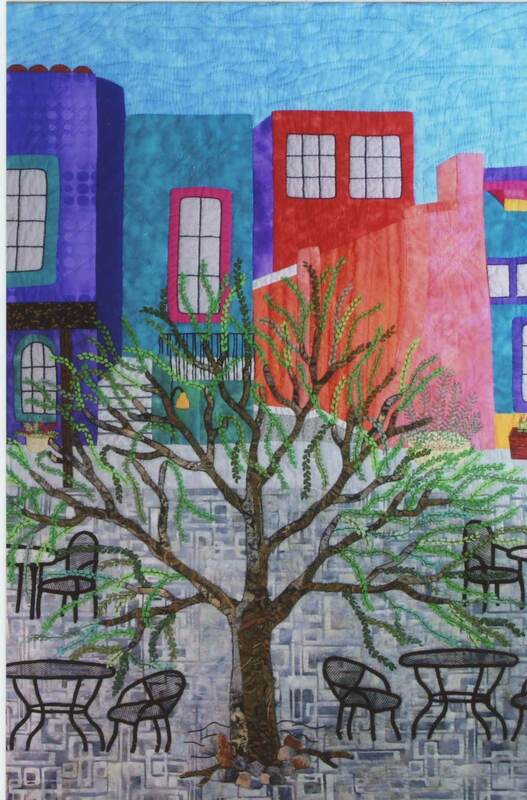 Sandy Lambert's "La Placita Sunday"
Along the way, she has moved into the art quilting world, and became a member of the group Fiber Artists of Southern Arizona. Lambert is a true artist in the medium, and highly devoted to that art. She works in her home studio almost daily, quilting by hand. 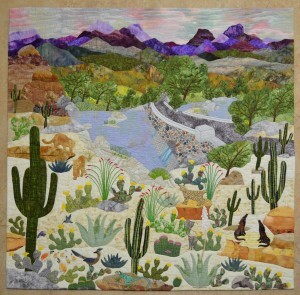 Her well honed eye for turning bits of colorful fabric into elements of landscape, architecture, fauna and flora are in full display in many of her quilts, including her entry in the Arizona Centennial “100 Years, 100 Quilts” exhibit, which is on display at the Arizona History Museum, 949 E. 2nd St., Tucson, Arizona, through the close of 2012. 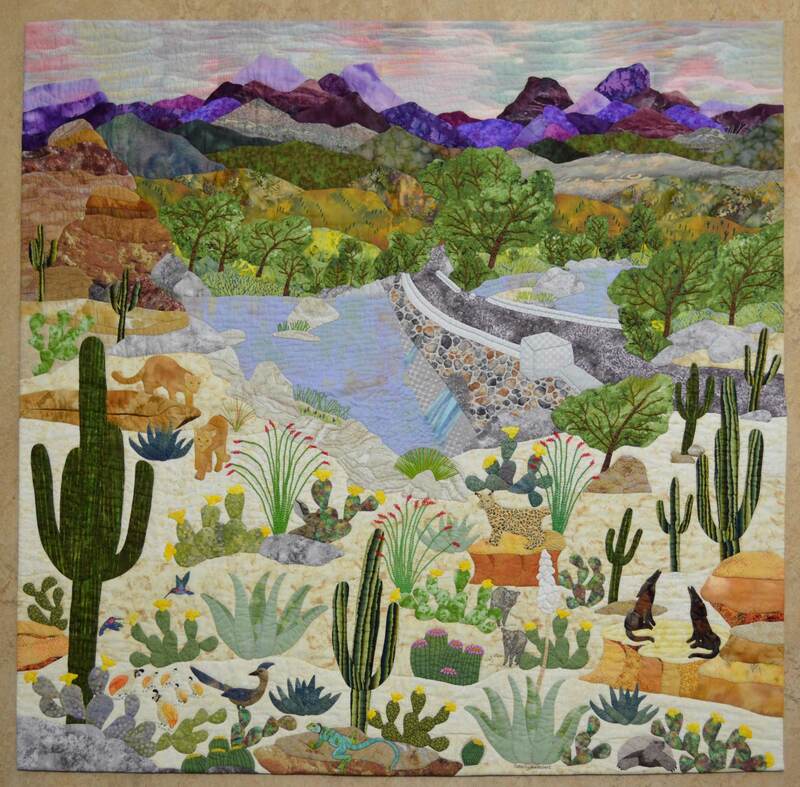 That quilt, titled “Abundance – Sabino Canyon,” was inspired by her frequent hikes in the Tucson attraction, taking in the animals and plants, the water and trees, the mighty saguaro cacti and the rugged mountains to fashion her personal Arizona story for the show. Lambert was one of 13 quilters chosen for monthly video profiles to run throughout the centennial year. The interview was conducted in Sabino Canyon on a beautiful December day when the sun shone bright and the canyon was full of visitors. And yet, as Lambert pointed out, while many visited the canyon that day, one still had the sense of personal space and solitude that draws her back time and again to hike, meditate and take in its spectacular vistas. Detail, "Abundance - Sabino Canyon"
For more from the Quilt Project blog, click here. ~ by Daniel Buckley on March 6, 2012. Mil gracias. It was a pleasure to do. Sandy, I truly enjoyed your quilt and it brought back memories for me of hiking there in the early 70’s before all the improvements. It was peaceful then also. You captured all the elements of nature beautifully, and your workmanship was extraordinary. Thanks for sharing this quilt for the exhibit. 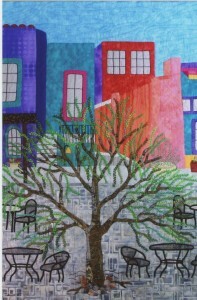 Sandy’s quilts are fantastic, a great art quilter. I’m so grateful to Dan for capturing the inspirations and sharing the stories for this project. Beautifully done video and the quilts are truly an inspiration. Thanks so much! Sandy keep up the great work! Dan, the video is great. You really captured Sandy’s spirit and artistic vision. Can’t wait to see the whole film soon. Very nice piece on Sandy Lambert! Thank yo so much for all the work you have done to make this visible to all, it is a true inspiration.